Garden Studio - Who Has The Best Garden Studio? A high quality garden studio is both an elegant and a practical addition to your garden. 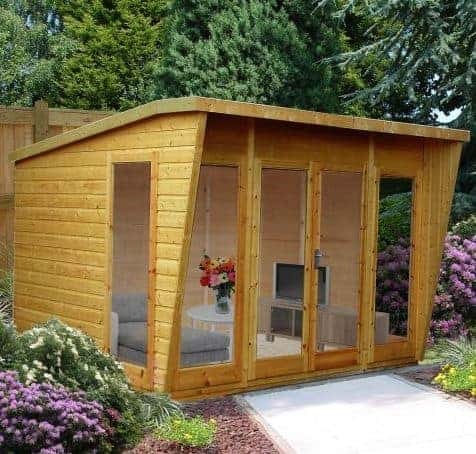 It can be a place to work in, as a home office, a place to relax in with the addition of some furniture, or a place to enjoy a craft or hobby; it will also be a visually appealing garden building that should draw envious glances from your neighbours and friends. 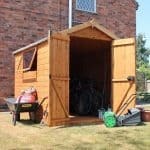 If you’re looking for a studio for your garden, then this WhatShed can help you find your perfect online purchase. Just below, we’ll reveal the criteria we used to define a garden studio, but we were pleased to find ten superb examples worthy of a place inside our WhatShed league table. We ranked them according to factors such as price and value for money, build and design quality, aesthetic appeal, and durability. When defining exactly what a garden studio is, for the purpose of this league table, we decided firstly upon a maximum area of ten foot by twelve foot to differentiate them from larger and often equally ornate log cabins. They also had to have an adequate supply of glazing to allow people to work inside, if they so chose, and finally they had to have a stylish design that really catches the eye. Selecting an overall champion from what was a very diverse category, in terms of both style and price, was difficult, so it’s well done to the BillyOh 5000 Sunroom which thanks to its great value, long warranty period, and good looks, is named the top garden studio that can be bought online in the UK today. 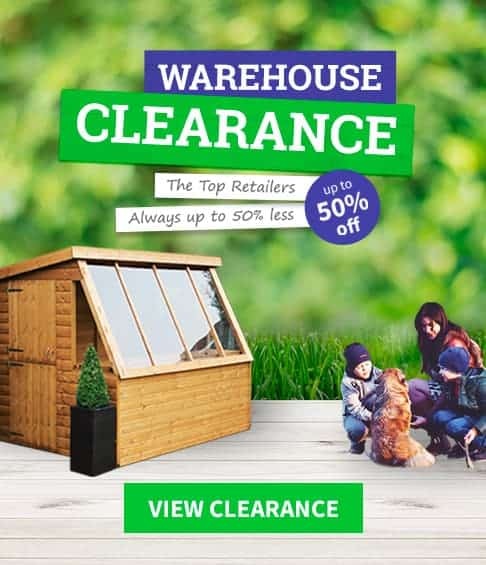 From garden sheds to greenhouses, WhatShed bring you the independent reviews you can rely on. At the end of this top ten guide we’ll discuss the criteria we used to define a garden studio, but one thing they all have in common is that they have an elegant design that helps them stand out from standard garden rooms or summer houses. That was certainly the case here, as we were instantly struck by the curved and slightly overhanging roof and by the white detailing that contrasts nicely with the tongue and groove timbers. We were even more impressed by the great value asking price of just over nine hundred pounds for a ten foot by ten foot garden studio with a 10 year guarantee, and in conjunction with the eye catching design this helps it secure top spot in our league table. As with the majority of garden studios in this top ten guide, the frontage is dominated by glazing, so there’s plenty of natural light inside whether you plan to use the building for work or leisure purposes. It should be noted that a floor has to be added as an optional extra, but we don’t feel this detracts from the overall value. 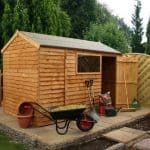 If you want a well sized and good looking garden studio at a highly affordable price, then this should be one of your first considerations. 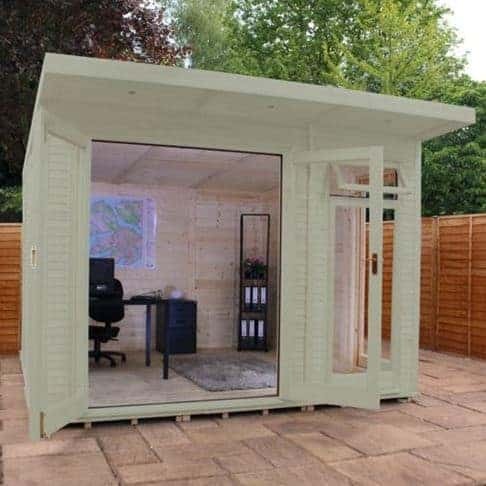 A garden studio can make an ideal summer time office for people who work from home, allowing them to escape the noise and temptations of the house. In order to be effective for this purpose, however, a lot of natural sunlight is required, which is where this Blenheim garden studio scores so highly. Its frontage consists almost entirely of glazing, and there are two long side windows as well, creating a warm, bright and welcoming interior. We were pleased to see that glass had been used in the windows as well, as opposed to the cheaper option of styrene or acrylic windows; this shows the dedication to using high quality components that we always admire. What really makes this garden studio stand out in our opinion, both visually and from a practical point of view, is the use of its fully glazed bi-fold double doors. It means that on hot days they can be opened wide to allow cooling air in, and it also makes it very simple to move furniture or other bulky items in and out. 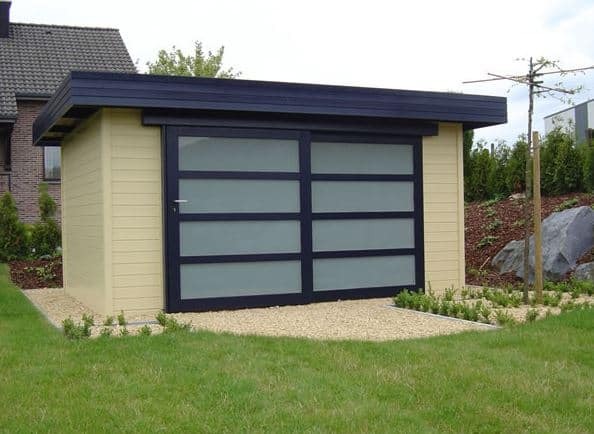 These doors also provide a touch of elegance and originality that is typical of the very best garden studios, and which gains this model the runner up position in our top ten league table. 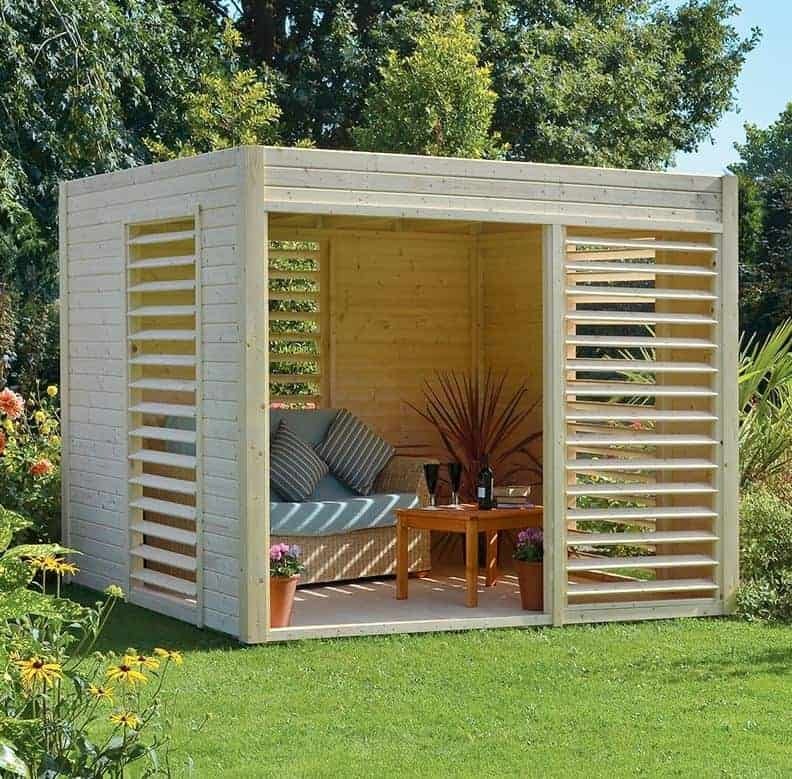 This ten foot by ten foot garden studio from Windsor is especially versatile, as it has been designed to be suitable for use as anything from a garden office to a gymnasium or sauna, to a pool house. Its generous dimensions make it easy to move the necessary equipment inside, and whilst there is still a lot of glazing to allow sunlight in, there are also boarded sections to provide more privacy and security. We were pleased to see this security aspect boosted even further by the inclusion of a key operated lock as standard. 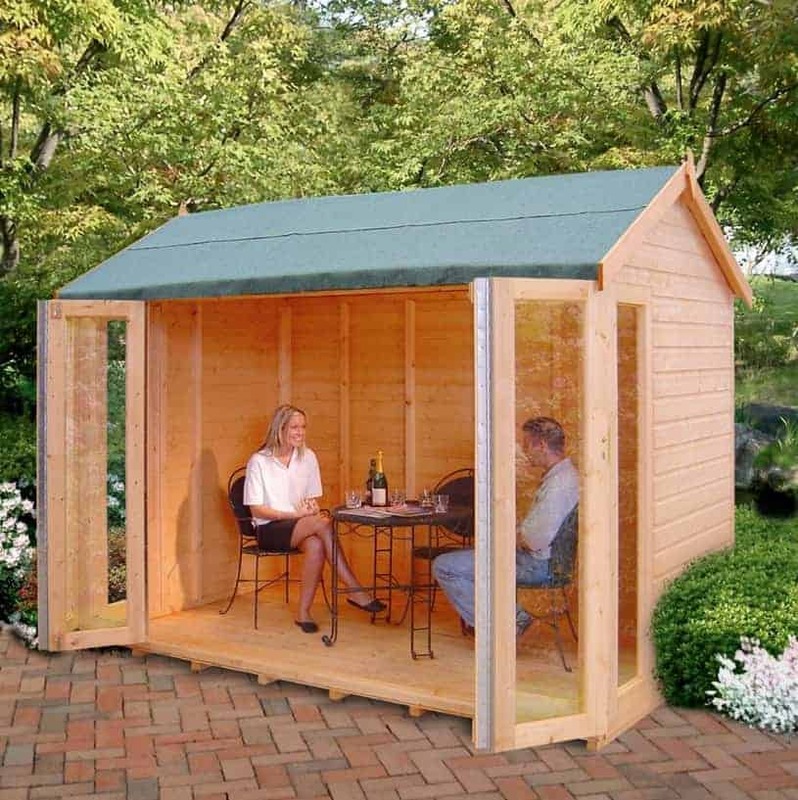 It’s not something we always see, even on the more expensive garden buildings we review. We found the mixture of glazing and high quality timber utilised on this garden studio to be very pleasing on the eye, so it has the good looks that could make it a garden feature in its own right. We were also pleased to find that it comes complete with a 10 year warranty, even though this does require a regular re-treatment schedule to be adhered to. 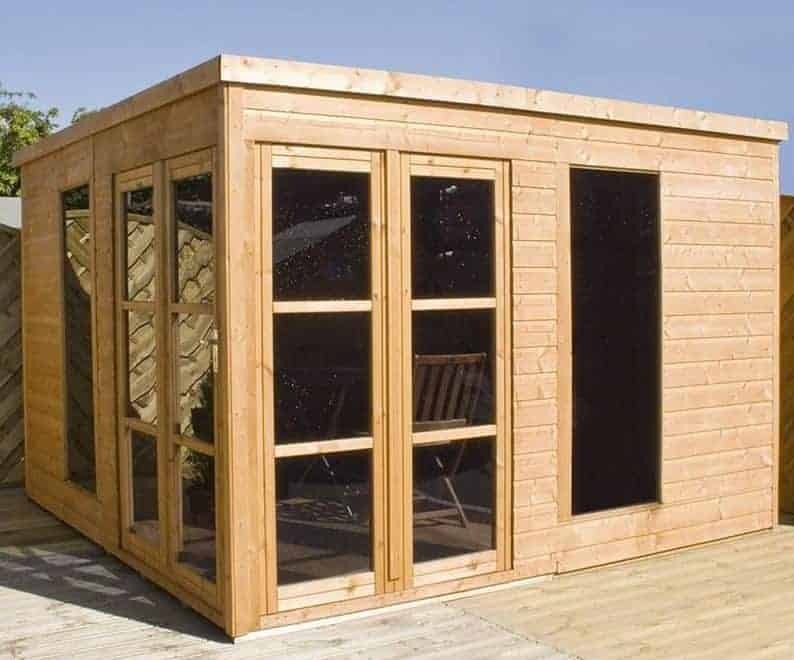 Its asking price of just under fourteen hundred pounds also represents reasonable value for money compared to many similarly sized garden studios, which is why it earns a place inside our top three. A curved roof is also a pleasing variation on traditional pent roofs, and this is the second garden studio in our league table to adopt one. Whilst the roof itself is certainly striking, and we particularly liked the addition of the diamond shaped finial at the front, we found it not quite as good looking as our table topping BillyOh garden studio. At nearly eleven hundred pounds for an eight foot by eight foot model it’s also not quite as good value, which accounts for their relative positions. 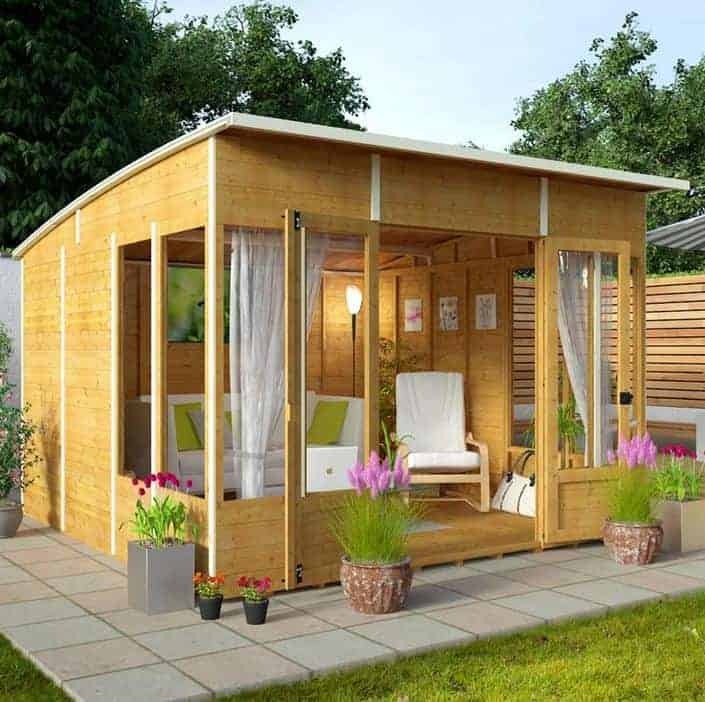 Nevertheless, we do feel that this garden studio represents good value for money, and being mid sized it could be an ideal choice for people who don’t have a lot of lawn space to spare. There’s still enough room inside to install a set of furniture, and the wide opening hinged double doors make it easy to transport items of any size inside the building. Once again there is a secure key operated lock supplied as standard, which is good news if you are storing furniture or valuable electrical equipment inside. The use of styrene for the glazing on the four windows also helps here, as it’s virtually shatter proof and therefore difficult for an opportune thief to break into. Storage space isn’t a primary concern for a garden studio, as they are more a building to spend time inside rather than simply put items inside. That’s why it’s unusual for garden studios to feature a side shed, as this one does. The right hand side of the building is accessible via its own personnel door, and as there are no windows looking into this area it provides a tough and secure storage space, especially as it has a key operated lock as well. 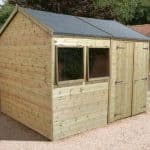 For that reason we think this would be a smart choice if you want a garden studio that you can keep computing equipment, or other valuables, in without having to take them in and out every day. The stylish design of the remainder of the building is enough for it to meet our garden studio criteria, and we were glad to see that it hadn’t compromised visual appeal for practicality. One feature that differentiates it from many of the other studios featured here is that it has a canopy and verandah at one side; we found this very visually attractive, and it makes a great shaded area to stand in and look out at your garden on a sunny day. With a base are of twelve foot by eight foot, it’s also among the largest garden studios featured here. Whilst a garden studio can provide an ideal location to relax or work in during the warmer months, they can become less welcoming during the colder months of the year. This generously proportioned garden studio from Mercia offers a practical, if not inexpensive, solution in that it is insulated using the reliable Airtec EcoQuilt system. 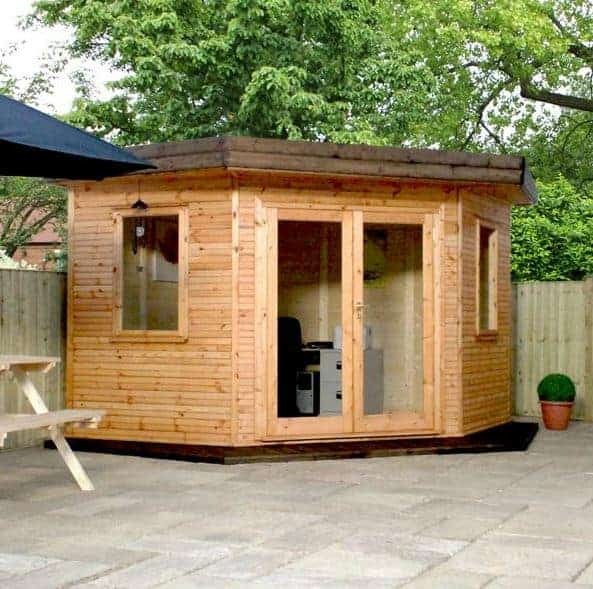 This effectively means that you can use this garden building in complete comfort all year round, which we feel is a very important feature for those who are looking for an office outside of the home. With a base area of 10’5 x 11’8 this is the largest garden studio in our top ten league table, so that makes it particularly suitable for those who want a large area to spend time in. The large double doors are fully glazed, and we were very pleased to see toughened safety glass in them, as it not only helps to keep heat in it helps to keep distracting noise out as well. This isn’t the only example of toughness we found, as we were also very impressed by the thicker than average cladding and framing. With a highly attractive willow paint applied as well, and a 10 year guarantee, this has a lot to recommend it. Only the high asking price prevents this achieving a much loftier position. We now have the second insulated garden studio in our WhatShed league table, and of course it once again provides the significant advantage of providing a warm and comfortable interior whatever the weather outside is like. Once again, however, it comes with a price tag in excess of six thousand pounds, which accounts for its position in the lower half of our guide. We also feel that it falls just short of the visual appeal of the Mercia studio we just looked at, although we imagine that it will be very well received by those who like their garden buildings to have a traditional appeal. This is the only garden studio in our league table to feature a five sided design. This means that although it is also one of the larger studios, with a base area of 10’5 x 10’3, it can fit neatly into corners of the garden. 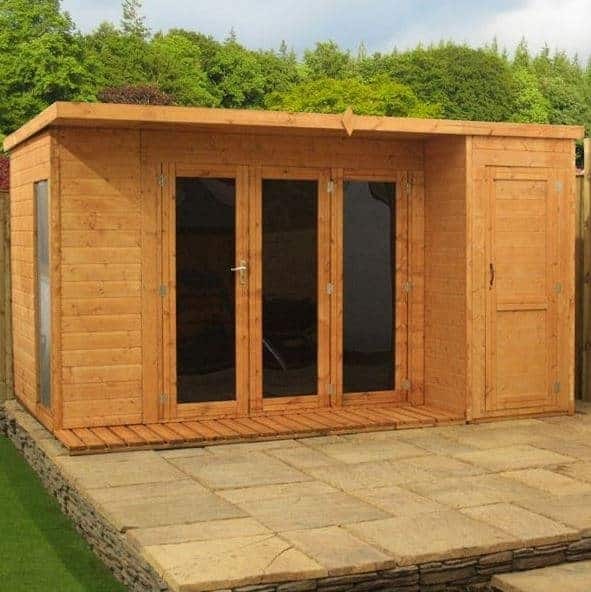 For that reason, this would be a smart choice for people wanting a large garden studio but who have a restricted amount of lawn space in which to position one. Once again, we were pleased to find double glazing used for the windows, and this also helps to make the garden studio as a whole more secure. If this falls within your budget, then it’s certainly worthy of consideration. One of the common denominators of a garden studio is that they place an emphasis upon design and visual appeal. 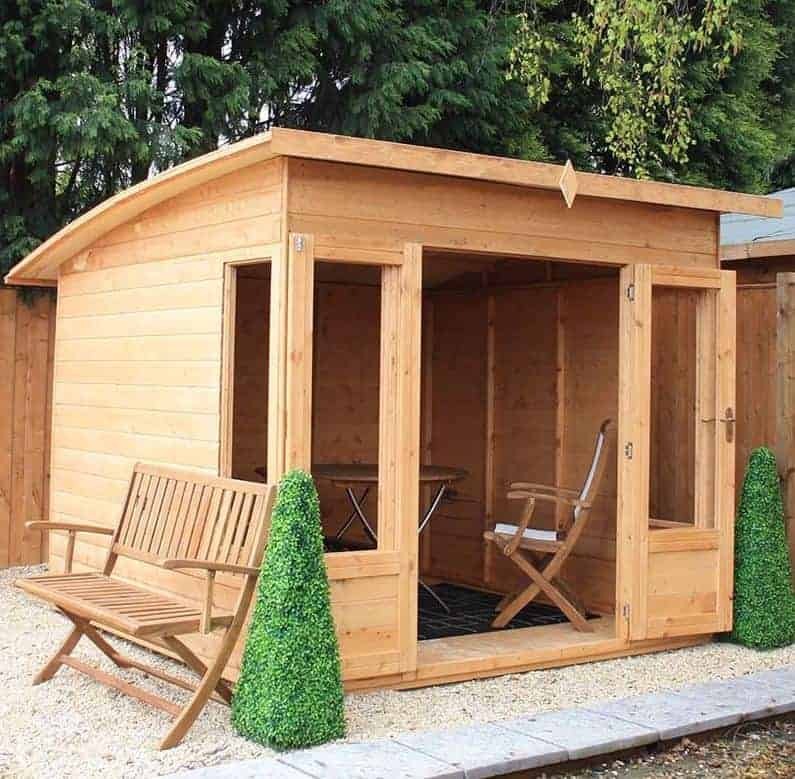 This Pinnacle studio is a great example, as it looks noticeably different to any other garden studio that we’ve reviewed. The first thing that caught our eye were the side walls which lean out an obtuse angle. It’s a little touch, but a very stylish one that makes it stand out from many similar sized garden buildings. The four glazed panels across the front, and two long side glazed panels, also help to create a striking look. 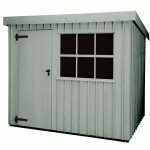 We also feel that this garden studio represents very good value for money, as it has a base area of approximately ten foot by ten foot and costs not much more than eleven hundred pounds. It’s the lack of an extended warranty that sees this particular garden studio languishing near the foot of our table, but its thicker than average 34 x 34 mm frame means that it feels stable once installed and should prove to be durable. If you don’t mind carrying out annual wood preserver treatments, and aren’t concerned by the lack of a long guarantee against rot, then we feel that this should prove to be a very good buy. This garden studio has no concerns about ventilation on a hot day as it has a largely open front. This pavilion style makes it unique among the models in this league table, and it certainly helped it grab our attention from the moment we saw it. The sections that aren’t open to the elements are made from very high quality 19mm tongue and groove cladding, which also includes the use of louvre panels. It’s a very original look, and yet we found it a very visually appealing one as well, and its name isn’t the only thing that has an Iberian ring about it. If you like to have a contemporary look about your home, and particularly favour the minimalist approach to decor, then this garden studio should fit in perfectly. Its open faced design means that it may not be ideal for use as a home office, but we feel it would make a very impressive location to entertain guests before or after a dinner party, and the pent roof covered in a strong natural mineral felt still provides protection from rain. 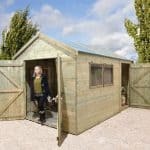 We liked the unique qualities of these garden studios, but the provision of only a one year warranty keeps it in the penultimate spot within our league table. This is one of the most contemporary looking garden buildings that we’ve seen, and its exciting design earns it the final place in our WhatShed top ten garden studio league table. Made by Tack, a European manufacturer who are renowned not only for their eye catching and innovative designs but also for the high quality of components that they use, the first thing that struck us was the large and wide door that dominates the frontage, fully glazed in a style evocative of traditional Japanese buildings. We also liked the number of optional extras that can be added to this garden studio, allowing the consumer to create a garden building that’s perfectly tailored to meet their needs. For example, it’s possible to upgrade the initial dip treatment to a pressure treatment that gives long lasting protection against the threat of wet rot. It should also be noted, however, that one of the options that should be taken up is a floor, as there isn’t one supplied as standard. It’s this, the high price tag and a lack of an extended warranty that keeps this striking studio in the tenth and final place in our league table, but if you want a truly original addition to your garden then this certainly deserves to be looked at.